Happy Anniversary to The Irish Gift House! The month of July marks two anniversaries for The Irish Gift House. On July 5th we marked 23 years in business, and 3 years ago, on July 27, we transitioned to an all on-line Irish gift store. Kerry and I, with help from her dad, Rod O'Neal, spent the 1994 Independence Day weekend putting the finishing touches on The Irish Gift House in Tempe, AZ so that we would be ready for the grand opening on July 5th. We did all the build outs ourselves and felt that we had created a charming representation of Ireland in the middle of the desert. We had a great assortment of Irish gifts, that just like today, focused on Irish jewelry, that included Claddagh rings and Claddagh jewelry, and Celtic jewelry, that included Celtic Crosses and Celtic wedding bands. All we needed opening day was a few customers. At first our customer base grew slowly and then all of a sudden, the flood gates opened up. By our first Christmas we knew that we would be around for a long time and Kerry and I were really having fun by our first St. Patrick's day. Over the years we have served multiple generations of customers. We have sold Claddagh wedding rings to couples, who then bought Claddagh rings for their children, and have now bought Irish gifts for their grandchildren. We sure made a lot of friends along the way. With the introduction of traditional Irish food, we found out just how many Irish immigrants had settled in metropolitan Phoenix area. With their Irish brogues and their friendly Irish demeanor, these Irishmen and Irishwomen added to the Irish atmosphere of our store. As the years progressed, our store was so crowded with Irish gifts and jewelry that we were concerned the Tempe fire marshal would shut us down. Except for some narrow passages, every inch of The Irish Gift House was utilized for display. We had eight jewelry display cases that included seven vertical displays! Just like today, we had every conceivable Celtic knot necklace and earrings, shamrock jewelry, Claddagh ring, Celtic Cross necklace and Celtic wedding band an Irish heart could desire. And were we busy, but then came the internet. We were still just as busy, but in a different way. Thankfully we had a heavy presence on the internet with our site, theirishgifthouse.com, and our on-line sales of Irish gifts keep growing as the web evolved, but we also noticed that our in store traffic was slowing down. Internet sales represented about 10% of our sales early on, but by 2012 we noticed that over 60% of our sales were on-line and the trend was growing. Or brick and mortar store was becoming a glorified warehouse for the internet. By the time we completed the transition to all on-line sales our store traffic was only 30% of our total sales; the decision to evolve was almost made for us. 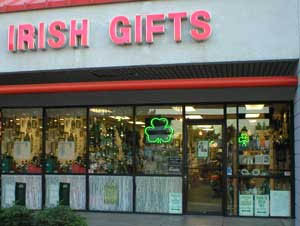 Until the next big change in retail, you will find The Irish Gift House on the internet.